Transfer Handle fits any style home bed (just slide between the box spring and mattress. It offers the safest and easiest way to get in and out of bed. The handle enables the elderly, injured or people with disabilities to be independent. Helps to prevent falls and injuries and will ease the burden on the caregiver. It is strong and stable providing all the support needed for safe transfers to walkers, bedside commodes or wheelchairs. 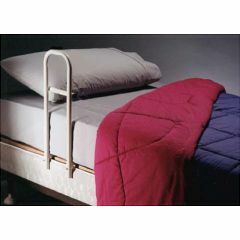 The heavy duty handle attaches to metal bed frames without tools. 250lb weight capacity. 22" L x 6" W.